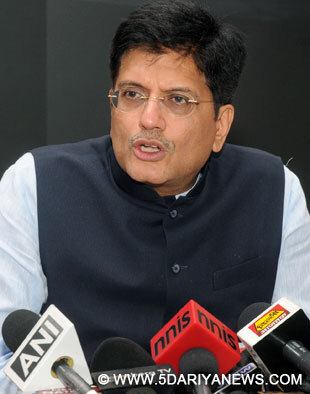 Around 280 million people in the country do not have basic electricity connection, Minister for Power, Coal and New and Renewable Energy Piyush Goyal said on Sunday. "Around 280 million people in India to this day do not have electricity connection at their homes. Till date, they are denied the basic thing like power," Goyal said while addressing the graduating class of the Indian School of Business (ISB) here. "The country's problem is not about the amount of power generation or the ability to generate. We have surplus power in large parts of the country," he added. "The mission we have set out to achieve is to get power for all by 2019 not by merely slogans but by actionable agenda, by true action on the ground," the minister said. He said his ministry was focusing on energy efficiency in a big way"On mathematical principles, 1.33 times of every unit of energy is saved given that India has an average 25 percent of AT&C (Aggregate Technical and Commercial) losses even today. So, for every unit saved, I am saving 1.33 unit. ""In 2.5 years from now, I can bring down energy wastage by 10 percent and am looking at powering those 280 million homes out of this energy saved," Goyal said.Goyal asked the ISB to come up with a proposal for an innovative laboratory on energy conservation for which his ministry was ready to provide funds.